I have a hodge podge of things I’d like to post about before I forget them, so forgive me if this post is a little bit of everything. First things first: we got a new puppy. New to us anyway. He showed up in our yard last Thursday and although initially I walked away (see previous post about our stray cats) when he was still out there a few hours later I couldn’t help myself. We took him to the vet to see if he was microchipped and ask if we should bring in fliers, and checked the lost ads, but the vet said if we wanted him we should keep him, so I got him all of his shots, etc. He came in a pack of three dogs so my feeling is he’s been out for a while, and he seems very happy to have a home now. He’s adorable and shy and will just curl up and sleep on me all day while I crochet. What a sweetie. 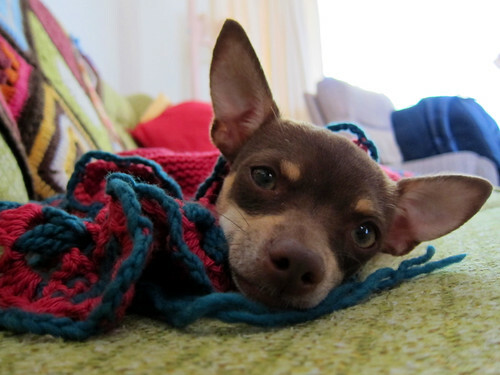 We named him Freddie, and he likes to wrap up in yarn and handknits (but so far no chewing-on-yarn problems!) so hooray! He’s giving me a bewildered “Get off of the computer so we can go sleep on the couch!” look as I type this post. In other news, the always entertaining Marlaina Bird has a new crochet class on Craftsy, called “Curvy Crochet” (she offers Curvy Knits, too!). This class is all about how to make garments that flatter your figure. 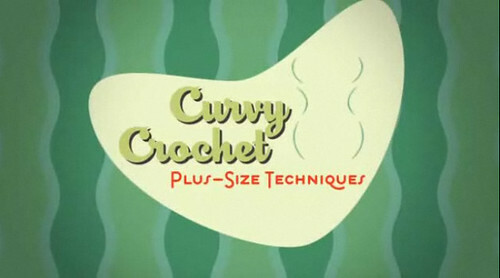 It’s tailored to plus size women but I’ve been watching some lessons, and they are useful for women of any size. She goes through how to properly measure, how to make a duct tape dress form, how to figure out what looks good on you,and how to alter patterns to fit YOU. And you’ll glean tips on reading charts, how to swatch, and how to work decreases within a stitch pattern. Plus, because of the interactive Craftsy platform, you can ask her questions throughout the course and get personalized feedback. I really think you will love Craftsy courses–and I know it’s hard to imagine what they are like or why they are worth paying for, but trust me–they’re good stuff! Sign up for Marly’s class using this link and you’ll get the course for only $29.99 (regular price: $49.99). That’s such a steal for Marly’s specialized instruction! And for a more in depth look at my Crafty Crochet Embellishments course, check out this thorough review from Stacey Trock of Fresh Stitches. I love it because she gives you an overview of what it is like to be a student in these courses. While you’re there, check out the preview for her new book, Crocheted Softies: 18 Adorable Animals from Around the World – a cute array of the amigurimi she’s known for. Yay Stacey! And finally, I wanted to mention that this year the Craft Yarn Council has declared October 14th “I Love Yarn Day“. I think for me (and many of you), every day is I Love Yarn Day, but this is a celebration I can get behind. The website lists some cute, free patterns for items you can wear to express your love of yarn, mine is a very literal interpretation that you can make from your favorite scraps. The sample actually got lost in the mail during shipping so I guess I’ll have to make another one! 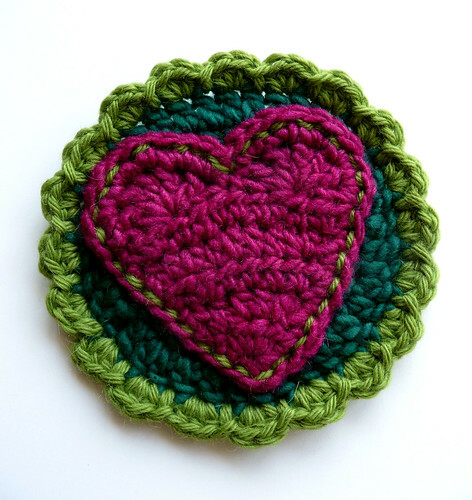 October 14th will be a great day to stitch in public, teach a friend to knit or crochet, host a yarn swap/stash cleanout with your friends, or anything else fun that shows your love of fiber. Check the website for more ideas. Hope your weekend is filled with fun and stitches! He is adorable. Even when he tries to eat my yarn. Silly pooch! Congratulations on the new addition to your family. He looks very content. That badge is SO cute! I know exactly what I'm making tonight now <3 Thank you!